Easter Island is one of the most remote inhabited single islands in the world, and perhaps the most mystical of them all. Easter Island was discovered by a Dutch explorer on Easter day — hence the name — and is also referred to as Rapa Nui from its native Polynesian roots. This Chilean territory is located about 3600 kilometers off the Pacific coast. 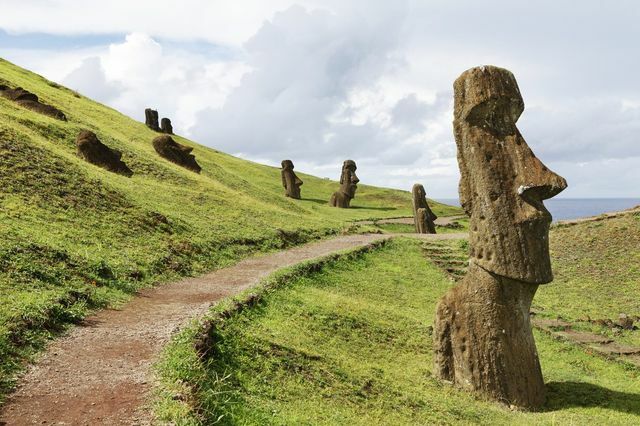 The main attractions on this isolated volcanic island are the giant stone statues called Moais, scattered about the landscape. The area is now protected as Rapa Nui Parque Nacional and named UNESCO world heritage site. A honeymoon in this enigmatic place is well suited for active couples who enjoy taking it slow. The Moais and awe inspiring craters with ocean views are best discovered on foot or bicycle. You may also try horseback riding, surfing or scuba diving. In fact, the water here is known to be so clear it can have to 60 meters of visibility! The city of Hanga Roa has a few markets, restaurants and bars to enjoy. Want to step off-the-beaten path for your honeymoon? Visit Easter Island and experience natural beauty and serenity. You can expect high costs and more crowds during peak season from January to March. Spring and Autumn are the shoulder seasons and tend to have temperate, mild climate. The weather is cool during July and August. Moais: Take a guided tour or explore independently the many circuits and sites. Markets of Hanga Roa: Browse the artisanal crafts and souvenirs to find some unique treasures. Surfing: The island boasts a few spots and board rentals are available. Scuba Diving: Explore underwater volcanic landscapes in open sea conditions and ridiculously clear blue water. Tapatai: A Rapa Nui culture festival and celebration that happens in late January and early February. Rano Rakaru: Massive crater and quarry where the stone was harvested to build the Moais. diy honeymoon in Polynesia anyone?